This two sided exam covers 8 primitive reflexes covered in the Retained Primitive Reflex Course. 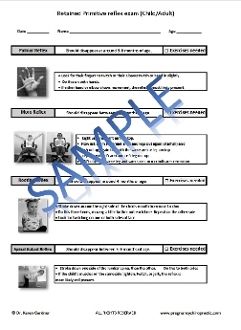 This form includes pictures of the 8 reflexes tested, how to test each reflex, when they should integrate, what would indicate retention and whether or not exercises are necessary. They are two sided and come in a tear off pad of 50 sheets.